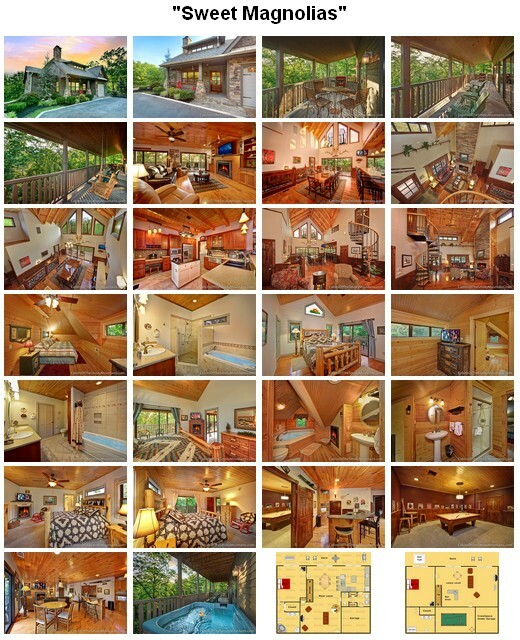 “Sweet Magnolias” is a 3-bedroom luxury cabin situated close to Pigeon Forge but offering a large degree of seclusion – a private world with wooded views in the trees of the Smoky Mountains. The solid stone face that the cabin presents to the world outside continues inside with a mix of stone and wood in vaulting architecture that places each master bedroom on its own floor. Each bedroom has its own full bathroom – with electric fireplaces for that special ambience – and two bathrooms have jacuzzis. A spiral staircase connects the main level to the upper floor, a king-of-the-castle bedroom and bathroom, with a lookout down to the villagers below in the living area, or a closed door to the whole world. The main level is the gathering space, with full kitchen and dining area, living area and also the home theater with sofa seating. Large windows and sliding doors all along one end of this central living area open onto the first deck, with the sights and sounds of the surrounding forest. 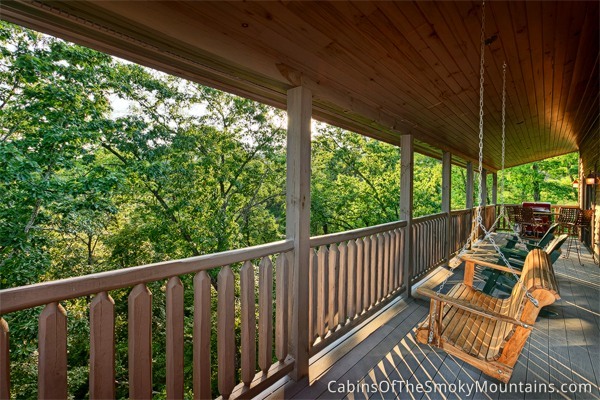 On this deck is the grill, just outside the kitchen, also the rocking chairs, and a porch swing sitting quietly waiting outside the master bedroom on this floor. 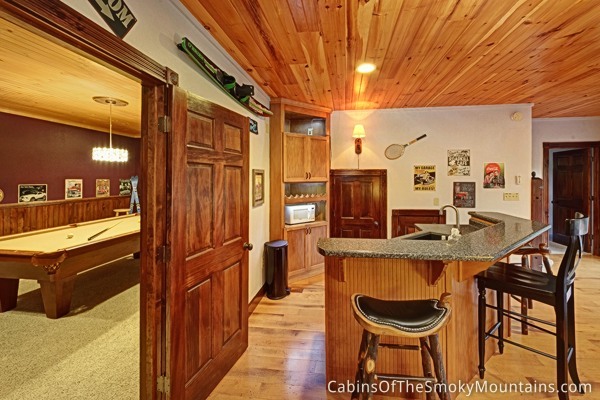 Below this deck is the lower level deck with hot tub, and indoors the pool table, wet bar, and lounge seating. This could be the serious sports and game game floor, and this floor too has its own master bedroom and bathroom. Privacy outside, privacy inside. 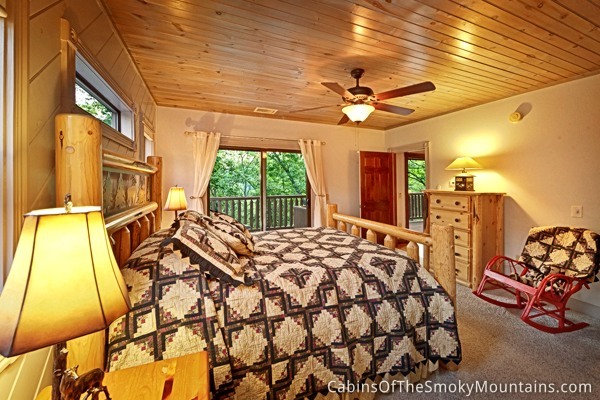 Three separate king bedrooms with an additional spare queen sleeper and half bath, to accommodate eight people in comfort. A good place for family or friends to gather, or a business retreat. 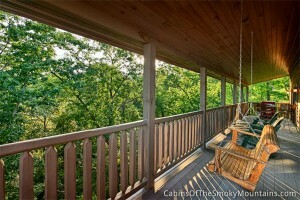 There’s no Internet in this cabin, because of its location, so bring your own if this matters. There is satellite TV, but call us to discuss cell-phone connectivity. In the winter a four-wheel drive vehicle is recommended to get here, and this cabin also offers a garage, where your car can warm up and dry off. 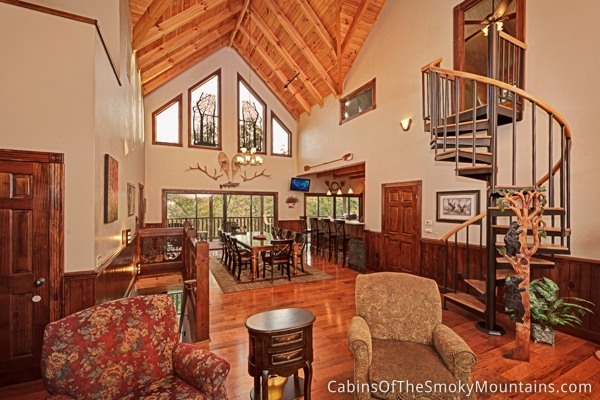 So would you want to leave this playworld of a cabin? As a practical matter, conference center and wedding facility access is included with the cabin, in case you might have larger events planned. 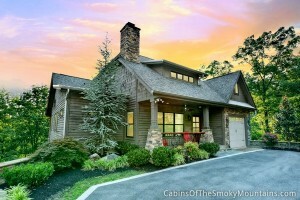 And the city of Pigeon Forge is a few minutes away, with its myriad attractions. Taxis are readily available also if you plan a night on the town. Sweet Magnolias offers a lot of choices, a multitude of enjoyments, as well as plenty of reason NOT to do much. Hang out talking and having fun, or just rocking, soaking and reflecting, and letting the mountains make the first move. Click here to check availability and book Sweet Magnolias for your next trip!